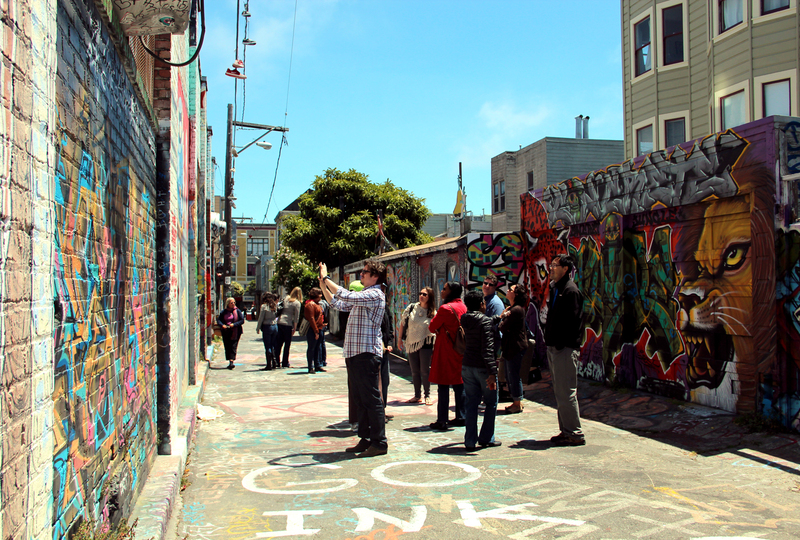 A tourist group browses Clarion Alley. A witness reported to San Francisco Police that two men estimated to be in their 20s struck a 30- or 40-year-old man with some unknown object in Clarion Alley at 9:20 a.m. Tuesday morning. The victim fell to the ground, police report, and the two suspects then took some unidentified items from the man’s pockets. Both suspects fled on foot, and have not been arrested. The victim was transported to the hospital in life-threatening condition. Police also reported another robbery on 20th Street between York and Hampshire streets at 12:07 a.m. on Wednesday. The 23-year-old female victim was walking along the street when two men between the ages of 15 and 20 approached her from behind and one of them pointed a handgun at her shoulder. The robbers took the victim’s bag, keys, cell phone and charger, and then fled on foot. No arrests have been made.